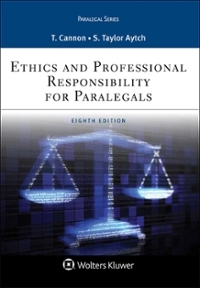 districtchronicles students can sell Ethics and Professional Responsibility for Paralegals (Aspen Paralegal) (ISBN# 145487337X) written by Therese A. Cannon, Sybil Taylor Aytch and receive a $38.88 check, along with a free pre-paid shipping label. Once you have sent in Ethics and Professional Responsibility for Paralegals (Aspen Paralegal) (ISBN# 145487337X), your Independent , DC Area textbook will be processed and your $38.88 check will be sent out to you within a matter days. You can also sell other districtchronicles textbooks, published by Wolters Kluwer and written by Therese A. Cannon, Sybil Taylor Aytch and receive checks.